Due to the premium reason that the author, himself, has contacted me to review this book, I readily accepted to review it. I somehow knew it is going to be author- signed. And alas, it was! Though this aspect was enough for me to rate it a perfect-ten, I restrain myself and remind myself, Honest and Unbiased review. Again, I set out reading the book unaware of its plot. Or any other detail dealing with the story, for that matter. From the very first paragraph of the novel I felt like it is written by some international author as Indian authors seldom venture to mold mentally unstable person the protagonist of their story. "They" use these words to describe Babloo - the doctors, his family, his teachers everyone... except Vandana. She treats him the way he wants the world to see him. Mumbai... the city that defines his ultimate desires. Will it allow him the love and normalcy he so craves? Vandana... yearns for a soul mate to rescue her from the confines of the Railway Colony they all live in. Is she looking in the right place? Rail Man... a fearless, real-life hero who succeeds in doing all that Babloo secretly wishes to do... is Babloo his inspiration or... is it the other way around? A random twist of fate on Mumbai’s endless, serpent-like, jangling local train tracks ties all these characters together in a complex weave of love, heartbreak, and courage. Babloo draws the reader into his fascinating, heart-rending journey through the twisted, choked lanes of Mumbai, into an open space where he can finally exhale, be born again. Rishi Vohra recently relocated back to Mumbai after completing a Green MBA from San Francisco State University and a Masters Diploma in Environmental Law, prior to which he has had a successful career in the Indian entertainment industry. Having been a guest columnist for various newspaper in India, he currently writer for delWine and is a Certified Specialists of Wine. This is his first novel. First of all, I would like to thank Rishi Vohra, the author, immensely for the signatured-copy of his book. Starting with the very first aspect of a book that anyone comes across - the cover design. 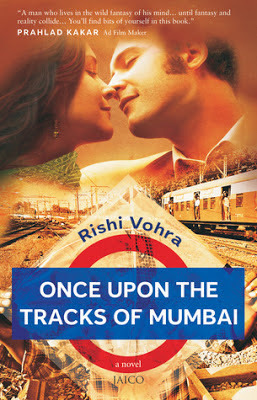 The cover design of this book depicts the love story of a couple and somehow related to the railway tracks of Mumbai. The rhombus behind the title of the book, which had the name of the author printed on it, is similar to the boards at Mumbai local train stations that announce the name of the station. If examined closely one notices a small kid holding a kite, the outline of which are in unclear sync with the station name depicting board. 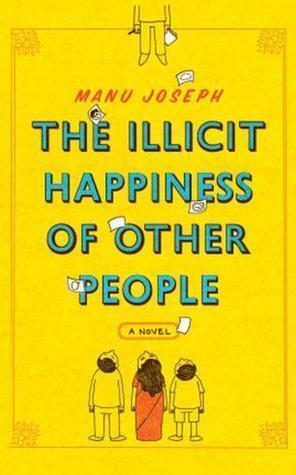 It gave me a basic impression, The story must be dealing majorly with the trains and railway tracks of Mumbai. However, it is true to some extent. After reading the book, I think the image of the couple, who were posing about-to-kiss, was unnecessary. That gives the false impression of the book as a love story. Of course, it contains love story of the protagonist, but it is not all love story. In fact, love story is about 40% of the story. I think any further details would spoil the excitement that the book holds, so I refrain myself and go on with the review. Off the record: Is it my bad or does the guy on the cover seems like a twin brother of the author? Jaico Publishers. I couldn't recollect reading of the books by these publishers. They can't be new to industry. The last page of the book contained the details of the publishing house quoting, "Established in 1946". (And that was even before India got its independence!) Hoping to read some of its book in near future. Both narration and language were the best aspects - other than the story - of this book. The author has this magical power of narration that seems both complex and simple at the same time. Its like a fluid. Every word flows in a calm, unglitching fashion. But there is a huge narrational anomaly. The entire story is narrated in first-person narration, where I is the protagonist, Balwant Srivastav a.k.a. Babloo. But there are parts of the story which doesn't contain the involvement of the character. That is one major flaw in the story. In fact, that is one restriction faced when the story is narrated in the first-person fashion. The exact inner feelings of the other characters and the scenes not involving the protagonist cannot be narrated. I have revealed earlier that the protagonist, Balwant Srivastav a.k.a. Babloo, is a bit mentally unstable. Actually, he was very much like any person, but only his way of thinking and communication skills gave him away. This, the readers realizes from the very first chapter. Strangely I started to pick similarities between Balwant Srivastava and Christopher Boone - the protagonist of the novel, The Curious Incident of the Dog in the Night-Time by Mark Haddon. Both of them are more dwelling inside than out. Both have the same logical, almost mechanical, type of thinking. I think that is till where the similarities spread out to. Frankly, the novel was pretty boring at the start. From the moment I learned that the protagonist is not normal, it started to feel foreign for me. Finally Indian authors are experimenting with the characters. Vandana is apple of Balwant's eye. A person with his mental capacity, who is more than often avoided or bullied at, finds a sweet heart in a girl, Vandana, who talks and shows some warmth to him. Those tiny actions of affections were enough to make him fall in with her. The possibilities of a girl loving a person like him were out of his unlikely mind. It is the latter part of the story kept me intrigued. I kept on reading the first quarter on the mere urge to complete this book, but the latter half of the book was real hooking. The last fifty pages or so were real page turners. Believe me, Rishi had just transforms a monologue to a full-fledged thrilling read. I would recommend this book to them who are looking for a fresh kinda novel from an Indian author. Books Reviewwala. Awesome Inc. theme. Theme images by molotovcoketail. Powered by Blogger.